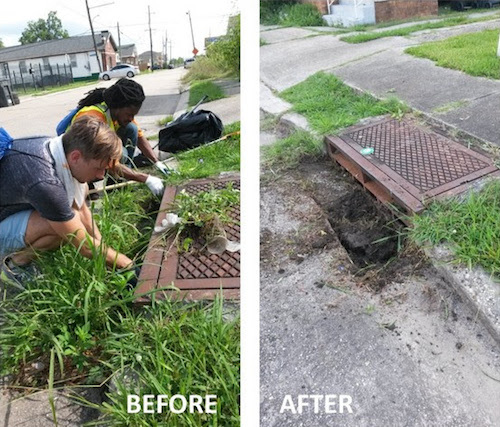 Mayor Mitch Landrieu’s Neighborhood Engagement Office will hold Catch Basin Cleaning Days for Districts A and D this Saturday, Oct. 28. Volunteers will clean as many catch basins as possible in a two-hour span. District A’s clean-up will meet at Brooks Shaw Temple UMC at 8818 Pear Street. The District D clean-up in Gentilly will meet at the Beacon Light Church at 1937 Mirabeau Avenue. Registration for group assignments begins at 8 a.m., and cleaning will be from 9 to 11 a.m. for both districts. Closed toe shoes and clothes to work in are recommended. Supplies will be provided, but participants are welcome to bring their own. Volunteers can register to participate online here. What happened to the $22 million that was set aside for this? Will the volunteers receive discounts on their sewer bills or credits on their property taxes? Don’t get me wrong……we cleaned the 2 near our house for 20 years……..because the city never did. Won’t do much good though to pick up the trash in front of the grates when they need to be shoveled out from the inside. Even know of a couple that are clogged with asphalt, thanks to the streets department.